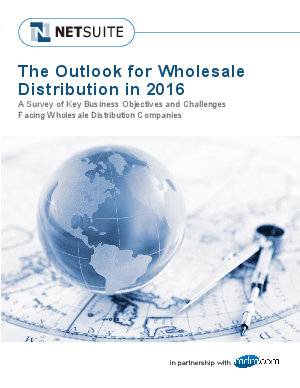 A soft economy and sagging sales have dampened expectations for 2016, although distributors and manufacturers still expect modest revenue growth this year, according to respondents in this industry outlook survey for 2016 from NetSuite in partnership with Modern Distribution Management. Nearly 40 percent of respondents expect revenue growth of 5 percent to 10 percent for the year with a handful of sectors – Consumer Products, Chemicals and Plastics, Grocery and Foodservices, and Pharmaceutical – projecting especially strong growth. However, companies have business- and industry-specific concerns ranging from uncertainty over the economy to worries that their customers will hold back on purchases even if economic conditions improve. Talent acquisition and retention, as it has been for a few years, also remains a factor in how well distributors can weather the downturn and prepare for the rebound. Not only that, but collecting data, dealing with the rising cost of doing business and providing a robust e-commerce platform all remain front of mind for distributors.